Posted on Wednesday, February 24th, 2010 at 6:06 pm. This coming weekend, February 26-28, a new movie about Taiwan will be coming to theaters. 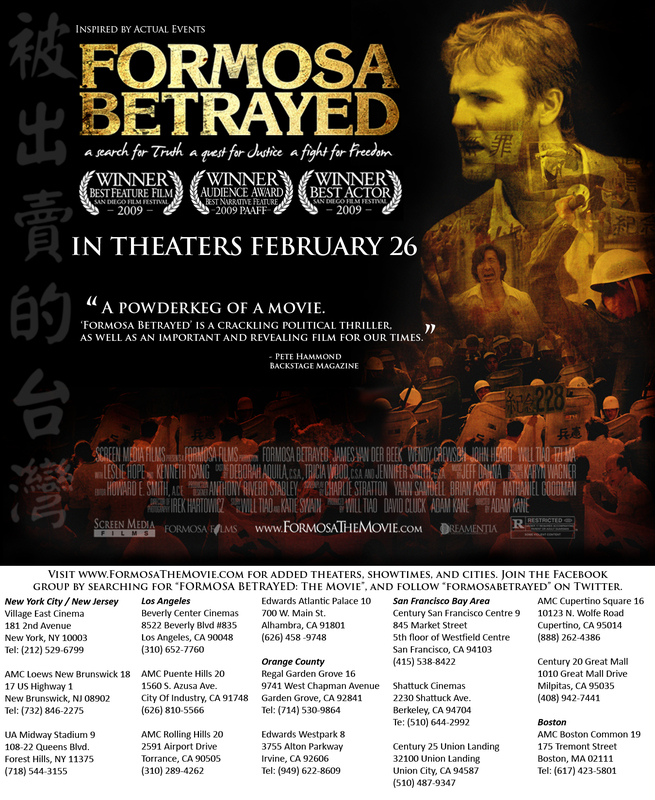 Formosa Betrayed is the first American film to ever deal with US-Taiwan relations and explore the issues of democracy, identity, and justice during the White Terror period in Taiwan. The movie was largely funded by Taiwanese all over the United States and Canada, who invested over $6 million into the film. This makes Formosa Betrayed one of the largest pro-Taiwan projects ever funded by the overseas Taiwanese community. Most of these investors are not wealthy — they are people like yourselves — hard working individuals who came to America to provide a better life for their children. I am one of those children. My parents are from Kaohsiung, Taiwan. While growing up, they taught me to call myself “Taiwanese,” not “Chinese”. This caused them much hardship, which included being put on a blacklist. Some of their friends had worse things happen to them. In some cases, people were killed. The Taiwanese people have suffered at the hands of many over the last century, but these stories have rarely been told or heard. As a second generation Taiwanese American, I feel it is my duty to educate my generation, as well as the world, about the struggles and suffering of the Taiwanese. We cannot allow our country’s history and our people’s hardships to be forgotten. Once that happens, it only becomes a matter of time before it is repeated. This is precisely why I spent the last five years of my life working on Formosa Betrayed. As the turbulent reaction to President Obama’s recent arms sale to Taiwan shows, US-China-Taiwan relations are still a hot button topic that is greeted by fleeting interest, faint support, or –worst of all– indifference by the American media. 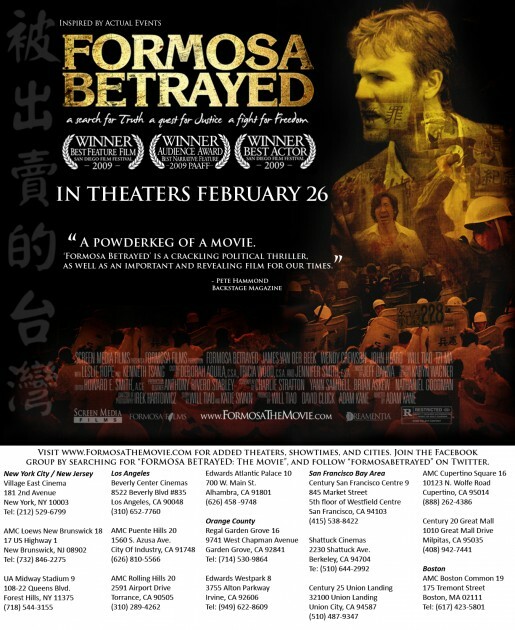 I am hoping the release of Formosa Betrayed will help spur greater awareness and wider discussion about these important matters in the United States and abroad. The Taiwanese people deserve to have an equal voice in affairs related to our country’s future. We cannot sit quietly and allow others to decide our fate. This is why I am urging you to see Formosa Betrayed with your children, family and friends. Not only will this movie educate our youth about our country’s embattled legacy, it will instill in them a sense of pride in their heritage and identity as Taiwanese. Additionally, your support of this film will tell the world that the Taiwanese people have a voice and we are demanding to be heard. No one else is going to do this for us. We must do this ourselves and we must do this now. A Mandarin version of this letter is attached below along with a new flier with up-to-date theater locations. Thank you for your time and interest. GO TAIWAN!!!! !